This first picture was taken right after Bridget drove her bike up over the top of George Bush. She hopped off, backed the bike back off of GB and then bent down to pick her up. One day last week, Sam texted me to tell me he would be late coming home from work. He said we should go ahead and eat without him. I was curious, as he goes in early and doesn't often need to stay late, but I just went ahead and ate dinner with the kids. As we were finishing up I got another text from Sam. 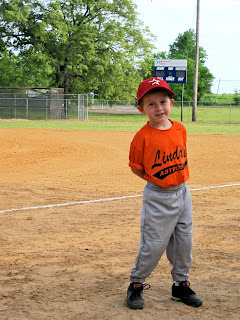 This one said, "There's a surprise coming down our road." I answered back, "Should I send the kids outside?" and he said, "Yep, with boots on." We made it outside just in time to see Sam pulling into the driveway in his little car. Behind him came our friend, pulling an animal trailer behind him. In the trailer were six goats! We have been planning on getting goats for a while and even had plans to go to the livestock auction the following weekend, so I was definitely surprised that he brought some home early. Turns out Sam had seen a sign offering 'goats for sale' up near where he works. He got a great deal on them, so he called his friend (since we don't own a livestock trailer) and had him help pick them up. The goats were pretty scared of us that first night, so we just turned them out into the pasture to let them get acquainted with their new area. We left food out for them and had a shelter ready for them but they wouldn't come anywhere near us. The next morning, Sam woke up early and headed out to check on the new goats. Instead of six, he found only four...coyotes had come in the night and killed the other two. In hindsight, we should have done everything we could to get them into their shelter for protection, but we didn't realize that the demon dogs coyotes would find them so quickly. Sam felt just awful about it. He took care of the dead goats and headed to work without saying much. I asked if there was anything I could do, he said, "Yes. Find me a donkey." donkey, so they make a pretty good team. available. After emailing the links to Sam, there wasn't much else I could do. So here is Scarlet "Sky", our new donkey! Isn't she the cutest? She spent the first night just outside the goat pen all night long. Apparently she takes her new job seriously! :) She is really a great animal. The boys just love her and she thrives on attention. In fact whenever we walk away from her, she tries to call us back by braying...it is the funniest sound I've ever heard. Couldn't resist posting a picture of Bridget with Mom's dog Mona. They have two dogs and the kids LOVED them both so much! Money (the other dog) wasn't quite sure about Bridget and her animal-lovin' ways, but Mona was sweet enough to let Bridget carry her around and sit in her lap for snuggles. The day following the zoo excursion we needed something low-key. The kids were getting pretty wiped out from all the fun by then. My mom suggested going shopping, so we headed out to one of the MANY local malls in her area. We didn't think much about time and just headed out, only to arrive at the mall at 9:45. And we all know most malls don't open until 10! Luckily there is a Super Target right nearby so we went over there to check out the dollar bins near the front. I don't get much time at Target since we live so far from one now, so I was pretty excited! Well, Bridget had other plans. She wanted a snack, or to push the basket into innocent passers-by, or NOT to sit in the basket, or anything but being in that store. She started screaming (throwing a tantrum), so I made sure my mom could watch the boys, clamped my hand over her mouth and headed outside with her to let her get it out of her system. It went on long enough that I had to text my mom and ask her for the keys to the car so we wouldn't continue to disturb everyone in the entire shopping center. It was rough. My mom and the boys continued shopping a while, picking out new socks for the entire family and a few fun gardening projects, as well as set of dog bowls that the kids could personalize for my mom's dogs. They had a great time while I soaked up the sun, sitting on the curb outside the car where Bridget was buckled in her car seat screaming still. She eventually calmed down and we headed back over to the mall. We had fun walking around and playing in the children's climbing area (and we even found a LEGO store...awesome!). After a while we were walking along on the second story and Henry shouted, "A train!!! Guys, come see, there was a TRAIN!" We found our way downstairs and wandered along in the direction Henry had seen the train. We finally came to the 'train depot' which was a little sign posted beside a seating area of the mall. A cute old man stepped out of the engine in his conductor hat and overalls and asked if we'd like to take a ride. Of course we said yes. We chose the caboose as it seemed to be the most roomy car and we all loaded up for our ride. He drove us down to the other end of the mall and back for what I think he told us was a seven minute ride. The kids enjoyed the ride, especially when they could get someone to wave at them. It was a fun surprise to find a train at the mall and a great treat to ride it! After the mall Mom treated us to lunch at "The Crazy Chicken" (okay, maybe it was called Pollo Loco but I prefer my version!) which was really good. We went home and let the kids get naps and then headed to the park. The neighborhood my mom lives in has wonderful parks, and a lot of 'em. Very cool. The kids also did the painting project my mom had found at Target. They really enjoyed decorating food bowls for the dogs, and they turned out pretty cute. The next morning we had to get up EARLY to get to the airport on time. The kids had already said goodbye to the dogs, but my mom brought them out to say one last goodbye. The flights home were mostly uneventful. The first flight is the longer one and all three kids did wonderfully. The second flight is only about 40 minutes and Bridget screamed through 25 minutes of that one. It wasn't my favorite. But we survived and she eventually fell asleep, about 10 minutes before we landed. We had such a fun time in Arizona! Many thanks to my mom and Jim for hosting us and providing us with such a relaxing and enjoyable time. We love you guys so much and are ever grateful for you! We spent the next day at the house. We ate cinnamon rolls with my brother before he had to head home. Then Mom drove Brian to the airport. Sam and I and the kids cleaned up the house and pool area and got Sam packed up to leave. When Mom got home from dropping Brian off, we all loaded up and headed to my mom's Costco. We had already been shopping at another one closer to her house, but we hadn't had the chance to visit the one she works at and meet some of her co-workers. After Costco it was time to head to the airport to drop Sam off. After saying a tearful goodbye to Sam (the boys were sad to see him go!) we headed back to the house. We spent the rest of that afternoon swimming, playing golf and visiting the cool neighborhood parks. The boys would probably say their highlight from that day would be walking the dogs. They just LOVED walking my mom's little dogs! The following day we headed out early for a trip to the Phoenix zoo. My kids would choose going to the zoo over many other exciting attractions. They love time spent at zoos and a new one is always something special to look forward to seeing! Everyone was a little grumpy as we started out our day. The kids were kind of picking at each other and not being their usual cheerful selves. We had packed a lunch, so we finally decided to have a (VERY EARLY) lunch and see if that helped. I warned them that if attitudes didn't improve we'd be heading home after that, even though we hadn't seen much of the zoo at that point. Miracle of miracles...the food helped! It seemed to my mom and I that they had just finished breakfast, but apparently they were all three hungry. After we ate it was like they were different kids! We walked along the many trails and paths and checked out the entire zoo. Every time the path got bumpy, Bridget would grab Jonah's hand to steady herself. It was so sweet watching them walk along hand-in-hand. I just had to have a picture (or 12) of that...but I'll control myself and only post one here. Throughout the zoo we found various physical challenges set up for the kids to test their strength. Henry was the only one of us able to do pull-ups...he is one strong boy! The other two just enjoyed hanging from the bar and having Grandma or I catch them just before they hit the ground. Even though Bridget's attitude improved, she seemed a little tired throughout the day. She spent a lot of time in the stroller and asking to be carried. Snacks did wonders for her, but it's hard to overcome exhaustion. 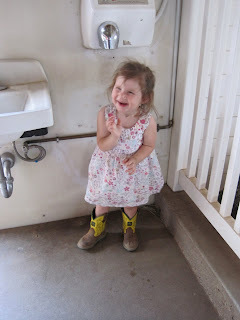 :) The one thing we finally found that truly perked up our little Bridget was the air dryer in the barn. We went in the petting zoo and visited the goats and on the way out they have a sink and hand dryer to wash up. Bridget washed her hands (a great joy for her!) and stood underneath the dryer, waving her hands to make it come on. It startled her as it came on as soon as she stepped under it, and it blew warm air all over her hair. Mom and I couldn't quit laughing as Bridget couldn't quit dancing underneath the blowing air. She found such amusement with that silly thing! A few times she even struck a Marilyn Monroe-type pose, pushing her dress down at the hem...it was just adorable. We got a couple of group shots with the self-timer on my camera. I just love the self-timer! This one, down near the monkey areas, is my favorite. The next few days of vacation consisted of lots of pool time for the kids, some putting practice and a MLB game (the Arizona Diamondbacks vs the Pittsburgh Pirates). My mom's husband is a BIG golf fan. That is actually an understatement, but I'll leave it at that. :) When they bought this house a year ago, the backyard was a mess. They took out all the rock and installed a pool and fake grass (which is amazing! You'd never know it's fake...really!). 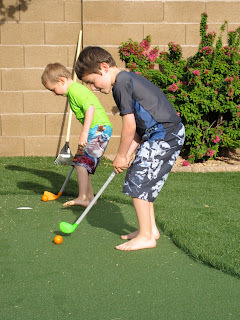 Jim also put in a putting green, which the boys thought was incredibly awesome. They spent any time they weren't in the pool at the putting green. Turns out that Henry has quite an affinity for golf! The pool doesn't have a heater, which isn't really a problem in the summer, but they aren't quite into Arizona summer temperatures yet. So it was a little chilly for swimming but that didn't stop the kids from hopping right in! Henry found it to be cold and never has liked being cold. Thus, he swam a little but avoided any extended time in the pool. Jonah, on the other hand, spent every waking moment he could in the pool. We had to actually limit his time in the pool every time we'd notice his little body doing uncontrollable shivers! Bridget didn't feel like doing much more than playing on the shallow steps, and definitely preferred her perch from the hammock with her little friend Mona (one of my mom's little dogs). Brian bought the kids some fingers to wave around during the game. They made good use of them, since the D'backs won 15-6. Those boys sat through the entire game and loved every minute of it. 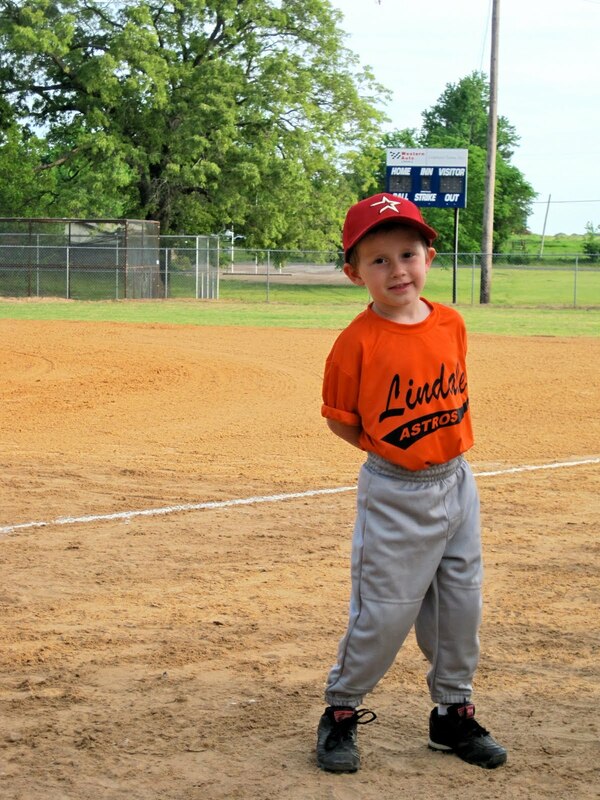 I might have a couple of little baseball fans on my hands! I think I forgot to take a picture of the little dogs, but the stadium was handing out webkinz dogs when we first walked in. They all had a 'collar' around their necks that was actually a D'backs bracelet for the kids to wear. That was a fun treat upon walking in the building! Bridget figured out pretty quickly that if she looked at anything longingly or announced, "I want ____" that Jim would buy it for her. So she had cracker jacks, cotton candy, ice-cold water, my mom's sunglasses, sitting in whoever's lap she chose...pretty much whatever she wanted. 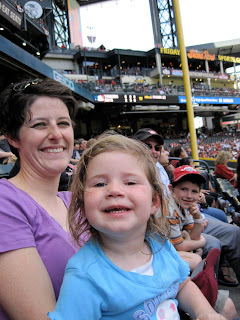 She had fun too, although I don't think she saw much of the game. Here's a group shot before we left the stadium...check out the kid's hats and t-shirts! My mom splurged and treated all three kids to a Diamondbacks hat and shirt from the pro shop. Henry hasn't taken his hat off since, with the exceptions of sleeping and eating (no hats at the table!). It was such a fun weekend! Sam and my brother had to head to their respective homes the following morning, but not before we had made a trip to Costco! We really miss living near a Costco and it's always fun to shop with my mom. The kids were sad to see their Daddy leave, but we all got to stay on in Arizona until Thursday. There was a lot more fun to be had! Sam's birthday coincided with our spring vacation this year...we went to Arizona to visit my mom! We loaded our bags and headed to AZ for a week in the sun. The kids were SO excited to be going on a plane. And they flew so well! Reading books, coloring pictures and eating snacks took up all of the time they weren't napping. I was so proud of them. When we got to the airport, my mom and my brother greeted us right outside of security. My brother flew in from Montana an hour before we got there. It was so great to see him too! Once at my mom and Jim's house, the kids changed into their swimming suits and hopped into the pool. Sam spent some time just relaxing, which is something that does not come naturally for him. (He managed just fine.) Jim grilled up chicken, hot dogs and hamburgers for our dinner and we had a feast to celebrate Sam's birthday. Afterward, of course there was cake. Mom and Jim served up a divine eclair cake (Sam's favorite!) as well as a beautiful lemon pie (made from lemons grown on their lemon tree in the back yard!). It was a great start to our trip!